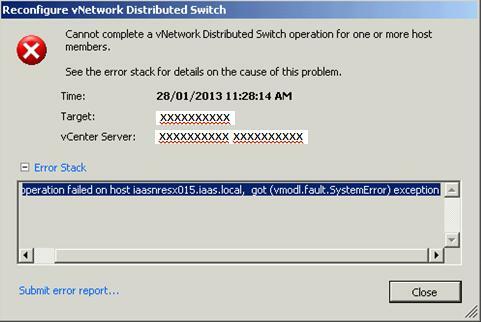 Recently I was working on adding VMware ESX/ESXi host to Nexus 1K (virtual distributed switch, VDS), but encountered following error message. - Then tried to add host to VSM from vcenter (vcenter – home- Networking – navigate to appropriate distributed switch – right click and select “add host” and follow the wizard) but it thrown following error. - Above task was failing at 74% after invoking Update Manager. - After spending some time on Google, found the fix. This is most likely due to vmware vcenter update manager (VUM). As I have already installed VEM, Update manager was trying to pull different version of VEM from VSM and its failing. Just stopped “VMware vCenter Update Manager” (VUM) service and tried adding ESXi host to VDS. It’s successful. How do you disable VUM on the VCSA? I can only find instructions for the Windows Version of vCenter.